One of my first memories of Munich 95 occured on my father’s 50th birthday, when a friend presented him with a recent facsimile edition of the manuscript. At the time, I had just been turned on to the existence of talmudic manuscripts and the prominent place of Munich 95 in Rabinovitz’s Dikdukei Sofrim by my Talmud rebbe at school, and the fact that a facsimile of what I understood to be the best manuscript of the Bavli was now on a shelf at my house made me feel really cool. Later, while studying in yeshiva, I would learn that Munich 95 isn’t really the “best” manuscript of the Bavli, but rather, that it is just the only complete one. Munich 95’s second colophon, on the verso of page 563. 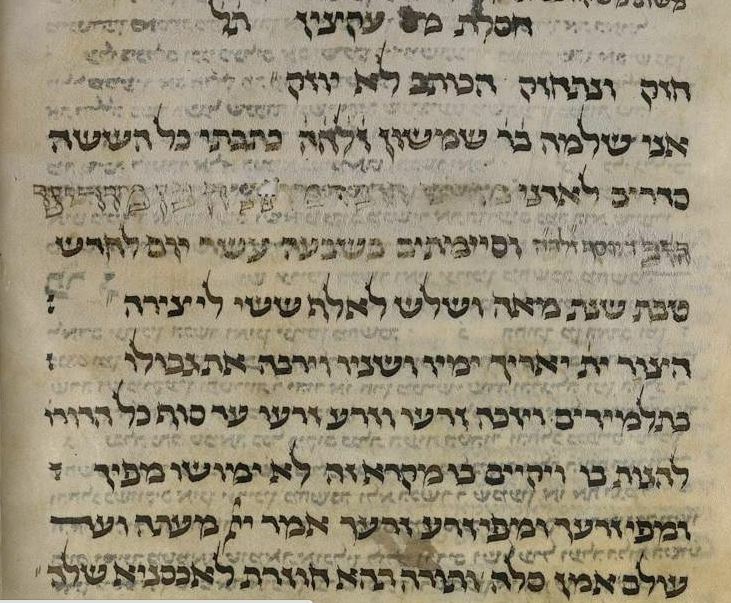 During my BA in Talmud at HebrewU I was taught that there’s no such thing as the “best manuscript” when discussing the Bavli, but that Munich 95 does have quite a lot of interesting qualities to it. These qualities are found on every level: First of all, its sheer size. As mentioned, Munich 95 is the only manuscript to cover the entire Bavli, and R. Shlomo even added the mishnaic tractates not covered by the Bavli and some other works as well. Reigning in at 577 folios (see here for a full list of its content), Munich 95 is absolutely ginourmas by codicological standards. The placement of the mishnah in the center of the page with the talmudic text surrounding is also one of the unique qualities of Munich 95. The manuscript is considered to be a prime example of middle Ashkenazic orthography, and R. Shlomo, to the chagrin of many, almost always writes words in shortened forms. One could devote an entire blog to the textual version of Munich 95. Talmudic scholarship of the past few decades has shown that a general evaluation of the version of a manuscript of this size cannot be provided, and that one can maybe describe its version of a given chapter or tractate. What is sure, however, is that whatever the section at hand, one is bound to find something interesting in Munich 95 or in its many glosses, and the partial list of secondary literature on the manuscript found in Sussman’s Thesaurus, listing some fifty different items, bears witness to the manuscript’s extreme importance in talmudic scholarship. I can’t help but end this stormy week here in Jerusalem without a note of gratitude for R. Shlomo the son of R. Shimshon.